What's drastically on the rise in the U.S. & other countries recently? Churches are ransacked & desecrated. Sacred images are smashed to pieces. Consecrated hosts are scattered all about & trampled underfoot. But perhaps not as overtly shocking but of similar concern & more within our power to change is the loss of faith in & reverence for the Real Presence of Christ in the Eucharist (including many who consider themselves to be “good Catholics”). 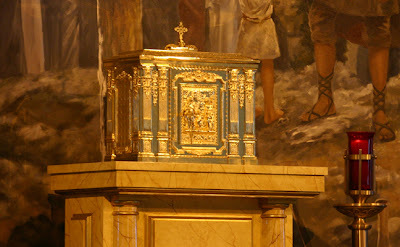 Along with the Eastern Orthodox, every Catholic should know the one reason that makes their churches uniquely different than all others throughout the whole world: the Real Presence of Jesus Christ in the Most Blessed Sacrament (i.e., the Eucharist, which is received during Mass as Holy Communion). We see the sanctuary candle (usually encased in red-colored glass) burning next to the tabernacle, & we know SOMEONE is present here. That's why we prayerfully genuflect in adoration, reverently making the sign of the cross. This simple witness of our faith works wonders in overcoming the loss of reverence. Now-a-days, people are dying for many reasons. When I die, I want to die for CHRIST, for love of HIM & HIS holy Will, not for some half-baked “cause,” personal philosophy, or even...sin. 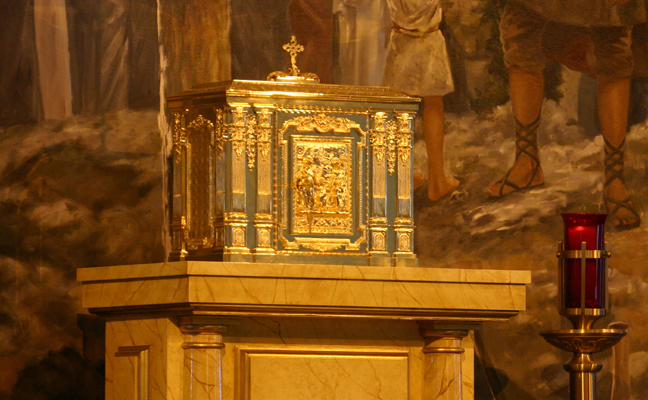 Just imagine the emptiness of the world without Jesus present in every tabernacle! A desolate wasteland... And yet, every one of our souls is a living temple where God already dwells through Baptism, & He desires to increase His presence & love in us & our personal union with Him through every Communion well-received. Whenever a baptized Catholic in the state of grace receives Jesus in Holy Communion with the proper dispositions, we give joy to Jesus who desires to dwell in us fully - we become living tabernacles! And people notice when Jesus' love shines out!